…I was retracing, in some half-conscious way, earlier journeys, trying to feel between finger and thumb some thread of trauma and survival from those earlier generations. I wanted to know how suffering had found us, and what we made of it. I wanted to be able to touch it, like the frayed edge of my serape, with its jagged and esoteric key design. 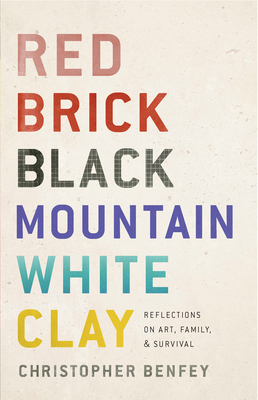 Red Brick, Black Mountain, White Clay is a book that defies classification. It’s a memoir, it’s a study of folk art, of geology, of history. It’s creative nonfiction at its best, I think, because it weaves several genres together into an interesting, cohesive whole. Christopher Benefy sets out “searching for patterns in the wanderings of his far-flung family.” He looks for those patterns in geology – the red brick and folk pottery of of North Carolina, where his mother (the daughter of brickmakers and bricklayers) was raised; and the white clay so coveted by early potters like Wedgewood and Benefy’s Quaker ancestor William Bartram, for making fine porcelain. He looks for patterns in the art created at the Black Mountain College, where artists Josef and Ani Albers (his Great Aunt and Uncle) explored the contrasts of texture and pattern in pottery and design. Along the way the takes some side roads into Mexico, Japan, and Nazi Germany. His cast of characters include scholars, artists, craftsman, Quakers, and poets, as well as his own parents whose story he tells with affection and understanding. Rarely does Benefy go awry in this journey. Occasionally the narrative derails a bit for me – when he wanders too far into the past discussing Josiah Wedgewood or the Cherokee nation. But mostly I was deeply engaged with his evocative journey into the past. My grandparents’ pitcher on the telephone table was glazed with orange lead and speckled with random spots of black iron that had oxidized during the long firing in the half-buried “groundhog” kiln. The glaze was known as tobacco spit. Only now, writing down the familiar name, do I see what it means: the color of chewing tobacco spat out on the ground. A work of pottery like my grandparents’ orange pitcher lives in two different worlds. It is beautiful to look at, and Jugtown pots during the last fifty years have migrated steadily from private homes into museums. But these pots were also made for use, for keeping the iced tea cold. The German philosopher Georg Simmel, in a beautiful essay called “The Handle,” wrote about this double life. A pottery vessel, he wrote, unlike a painting or statue, is not intended to be insulated and untouchable but is meant to fulfill a purpose – if only symbolically. For it is held in the hand and drawn into the movement of practical life. Thus the vessel stands in two worlds at one and the same time.” The handle marks the journey from one world to the other, it is the suspension bridge from the world of art to the world of use. Thanks to TLC Tours for the opportunity to read and review this very interesting book. Other stops on the tour can be found here. Dr. Blakemore speaking, how may I help you? Doctor, I’m having a horrible time! My love life is a mess, the bank is foreclosing on my house, I can’t decide what to do with my life, and my parents have disowned me! What should I do? My goodness, you are in dire straits! I’ll need to see you as soon as possible. But until you can get into the office, try two chapters of Pride and Prejudice, one hundred pages of Gone With the Wind, the last half of Little Women, and at least 50 pages of A Tree Grows in Brooklyn. We’ll call in the order to your local library immediately. Thank you so much, Doctor! I’ll start reading right away! Who would imagine literature as a cure for life’s ills? Erin Blakemore, that’s who. Her clever and delightful compendium, The Heroine’s Bookshelf, is a literary PDR (Physicians Desk Reference) of life lessons from literary characters. The book, which was just released in a ridiculously cute paperback version, revisits some of the great ladies of literature and their fictional heroines, looking at what each one has to convey to their 21st century counterparts. The book is divided into a dozen categories to explore, and Blakemore chooses one author/literary heroine per topic. Jane Austen and Lizzy Bennet (Pride and Prejudice) teach us about Self, Margaret Mitchell and Scarlett O’Hara (Gone With the Wind) encourage us to Fight for our happiness, Louisa May Alcott and Jo March (Little Women) urge us to be Ambitious in life’s undertakings. We learn about Compassion from Harper Lee and Scout Finch (To Kill a Mockinbird) and Faith from Zora Neale Hurston and Janie Crawford (Their Eyes Were Watching God). My personal favorite – Miss Scarlett herself, who has always epitomized grit and sass of a sort I’ve always aspired to and never quite achieved. Her creator, Margaret (Peggy) Mitchell, was more than a little like her. “Externally, Peggy managed to be everything that was expected of her: gracious, inviting, a good conversationalist, and an expert flatterer. But the tiny body that obediently danced, sat, and played along concealed a defiant, unruly mind.” Mitchell married a Rhett Butler type bounder (but with none of Rhett’s better qualities, apparently) who abused her repeatedly. When their marriage failed, she had to make it on her own, which was no mean feat in the mid 1930’s. But make it she did, with Scarlett-like determination, clawing her way to success with Scarlett as her ticket. I really enjoyed the way Blakemore delved into the backgrounds of the authors as well as the characters, comparing and contrasting the personalities and experiences. It’s amazing how often an author’s life and personality were polar opposites to their most beloved characters. And also just as amazing when they intersected perfectly. The Heroine’s Bookshelf should be on every woman’s bookshelf. It’s not only a great read for a winter weekend, but also a sure fire literary cure for whatever ails you. 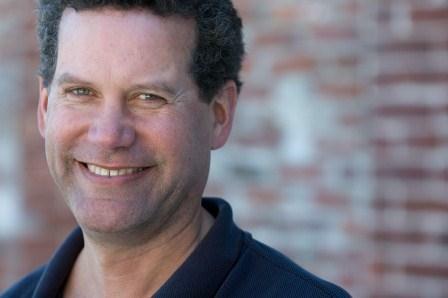 Erin Blakemore learned to drool over Darcy and cry over Little Women in suburban San Diego, California. These days, her inner heroine loves roller derby, running her own business, and hiking in her adopted hometown of Boulder, Colorado. 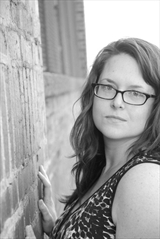 Read Erin’s blog at theheroinesbookshelf.com. 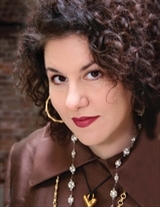 You can also follow her on Twitter, @heroinebook, and connect with her on Facebook. Her website is erinblakemore.com. Thanks to TLC Tours for the opportunity to read this delightful book! My grandparents lived with us when I was growing up, and my Great-Grandmother lived just across the street. Having such a strong female presence in my life was a blessing, and I believe their constant and unconditional love helped me become a better parent. As I prepare to become a grandmother for the first time, I’m recalling those lessons every day, hoping I can be as loving and supportive as they were. 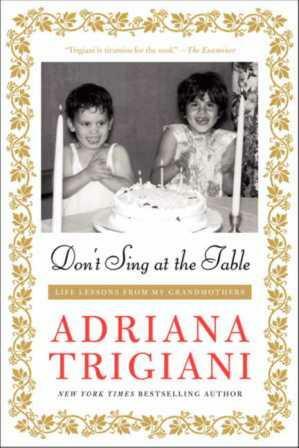 Because of my close relationship with my grandmothers, I was pre-disposed to love Adriana Trigiani’s memoir, Don’t Sing at the Table. After all, with a subtitle like Life Lessons From My Grandmothers, how could it not appeal to me? Hadn’t I spent my formative years at my Grandmother’s feet? Not surprisingly, I did love the book. 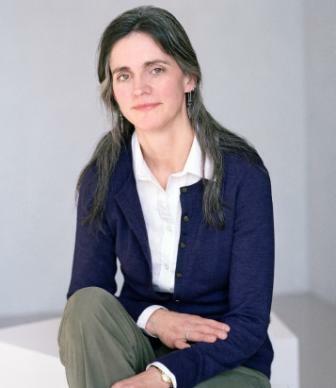 Trigiani takes us on a backstage tour of her grandmother’s lives – their successes, their hardships, their quirky personalities. As I read about their early days as young women fulfilling an American dream and running their own business to their later years still enjoying life, Lucia Spada and Viola Trigiani began to feel like members of my own family. The experience resembled sitting down at the table with hot coffee and Viola’s famous Sponge Cake, soaking up the stories, advice, and love poured out so generously in this little book. The book is memoir, but also something of a “how-to” live life according to these two wise women, lessons Trigiani herself has incorporated into her own being and is eager to pass along. In recalling the lessons her grandmothers have taught, Trigiani discovers sound wisdom for the many challenges facing modern women at work and at home. Advice on everything from how to dress and entertain, to how to raise children and handle the family finances is included. It’s comforting to realize that life lessons from a simpler time can be just as appropriate in this crazy modern world we live in today. Don’t Sing at the Table was a charming, delightful look at the lives of two extraordinary women, who, by their example, left their granddaughter with a wonderful legacy of love and wisdom. I have a feeling they would be very proud grandmothers! Thanks to TLC Book Tours for the opportunity to read this lovely book! Life is not always so idyllic in McAllaster, Michigan. Madeline Stone finds the truth of that when she moves into this tiny community on Lake Superior in Michigan’s Upper Peninsula. In fact, it’s a pretty hardscrabble existence for the folks who live there. Madeline, still reeling from the death of her adopted mother, leaves her Chicago city-life behind and moves north to help care for an aging family friend. At the same time, she’s in search of some truths about her past – the mother who abandoned her and the grandfather who refused to keep her – both of whom had their roots in this community. To her amazement, she comes to love this funny little town and its quirky inhabitants, who all know and care about one another. And she discovers who she really is, in more ways than one. If you know me at all, you’ll know this is just the kind of book I love. A book about community, about self-discovery, about overcoming fears and changing your life for the better. It’s a novel populated with funny, lovable characters, an interesting small town atmosphere, and best of all, it’s set in my home state. In fact, my father in law was born and raised in a small town in the UP which was probably a lot like McAllaster. The crusty characters in this book remind me of him, and their descriptions of life in this community help me understand a little more about him. 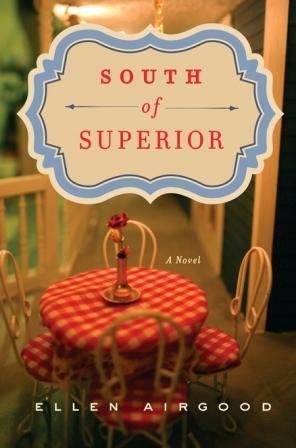 Ellen Airgood, author of South of Superior, obviously knows small town life. She runs an old-fashioned diner in Grand Marais, Michigan, where she is proprietor, waitress, and full time baker. This is her first novel, and it’s charming, entertaining, and heart-warming. The only thing missing was being able to sit on the porch of a cottage beside the lake while I read it. If an Up North vacation is in your future this summer, be sure and pack a copy of South of Superior in your suitcase. Thanks to TLC Tours for the opportunity to read this book. Other stops on the tour are listed here.